Closeup of a finished homemade, 2.5 inch, ravioli stuffed ricotta. Stuffed pasta, like almost every food type found in Italy, is defined by region. As my childhood neighbor from Genoa would always proclaim, homemade ravioli (meaning to wrap) are quintessentially Ligurian. Moreover, tortellini and cappelletti are understood as Emilian while Italians recognize agnelotti as derived from Piemonte. Stuffed pastas come in many shapes and sizes and their stuffings vary from vegetables, ricotta/other cheeses, and meats. In our southern Italian family, stuffed pasta such as ravioli and cannelloni always denoted a special celebration given our reliance on dry pasta (short and long) during most of the year. In Italy, stuffed pasta was always made by hand via a skilled family member, though most modern Italians now purchase their stuffed pastas from shops specializing in all sorts of pasta shapes. 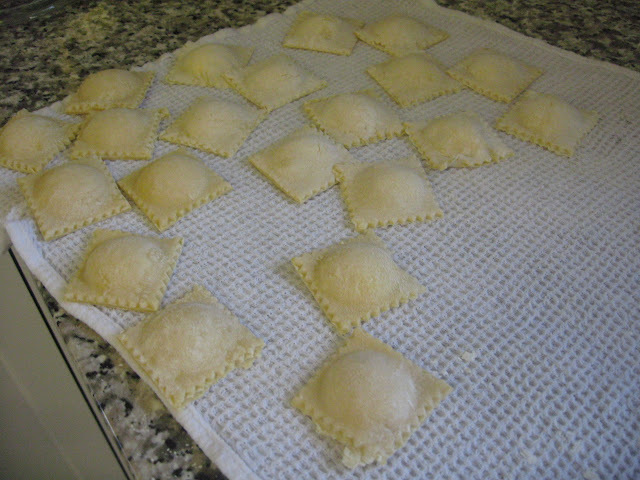 Our handmade ravioli recipe comes via our now 101 year old Ligurian neighbor Amelia where I spent many Sunday afternoons awaiting her delivery of handmade pasta gems. Begin by making a batch of our homemade pasta dough and roll it out fairly thin working your way to setting six or seven on your pasta machine (we use a hand cranked Imperia). Roll your finished dough out into roughly 13 inch by 6 inch sheets. We use a ravioli plate or form to make the stuffed pasta because it’s faster and more precise than using a single form type press. Our ravioli press produces 10 2.5 inch ravioli. 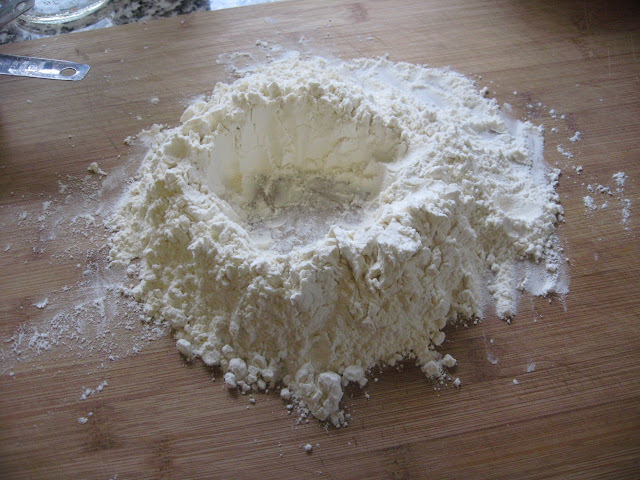 Begin by layering a single piece of dough over the metal press and then place the plastic piece that accompanies your press and create a divet in your pasta dough (this area is for your filling). 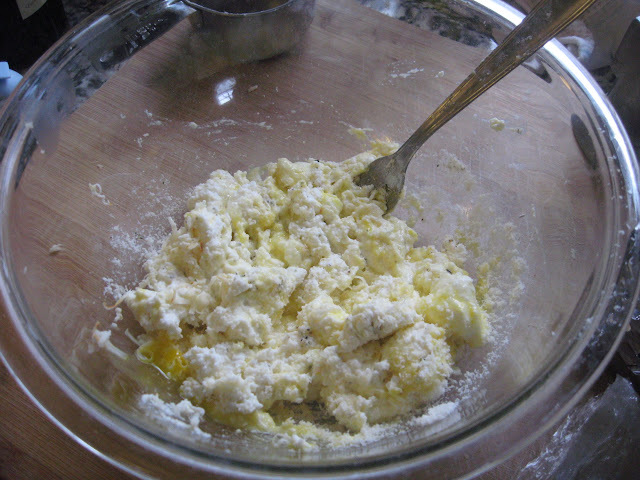 Place roughly 1.5-2 teaspoons of filling (see filling recipe below) in the divet and layer the second piece of dough over the form. 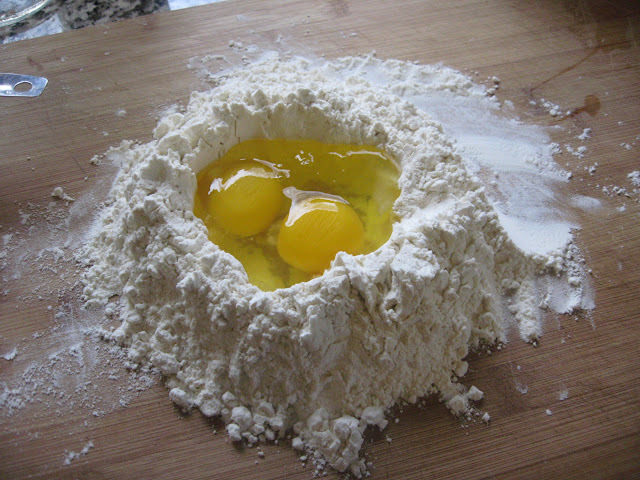 Gently use your hand to flatten the second layer of dough and thereafter use a rolling pin to bind and Provigil online sale cut through the two layers of pasta dough. 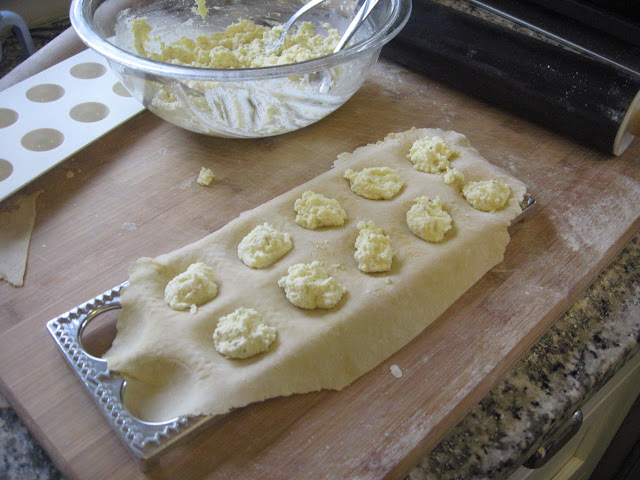 Remove the individual ravioli to a clean, and flowered, baking dish. 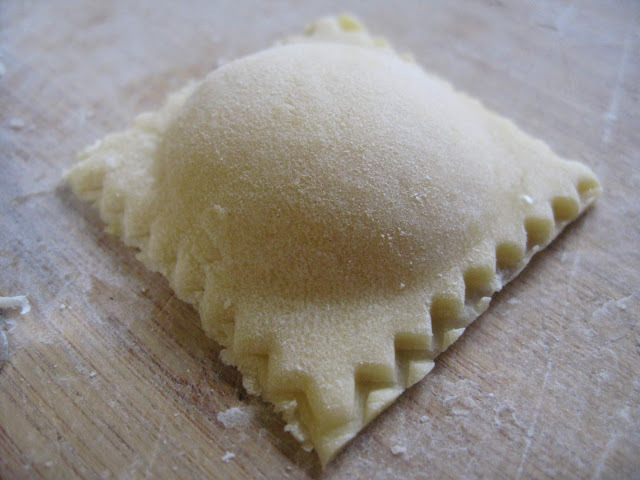 Bring a large pot of fresh water to a boil and cook the ravioli for 2-3 minutes depending on the size of the pasta and the thickness of the dough. Taste a few along the way if you have a hard time discerning when pasta is complete via touch (fresh pasta usually requires very little cooking time in comparison to dry pasta). Ravioli are delicate pasta types so dress them minimally and gently with butter and grated cheese or a simple tomato sauce. The traditional flour well ready for a few eggs. 1/2 cup of homemade ricotta (and/or made by a reputable market or shop). Note on supermarket ricotta: don’t buy it (it’s often bland, made poorly, and devoid of any real taste). If you don’t have access to ricotta made by a true Italian market then make it yourself. Rolling out pasta dough by hand (we recommend a pasta machine). Stuffing the ravioli with ricotta filling. 10 2.5 inch ravioli - note our dough was a bit thick given that we rolled it by hand, thus the ravioli didn't separate easily. 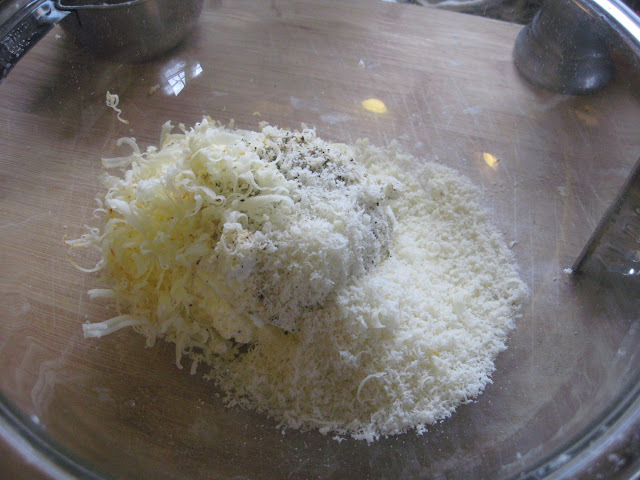 Ricotta filling with grated cheese, egg, mozzarella, etc. 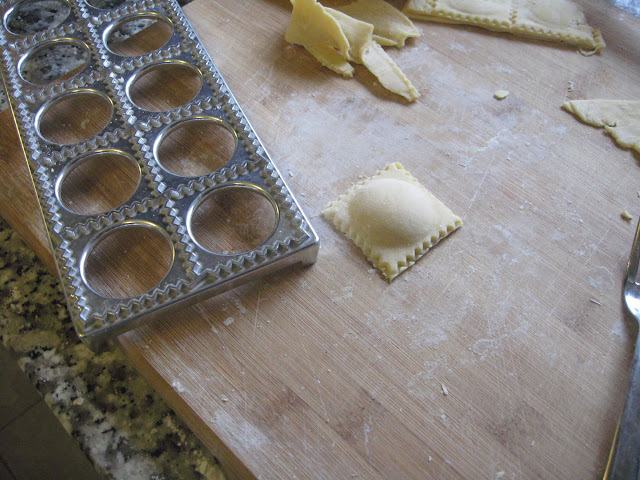 I have never used this type of ravioli press….is it easier than cutting individual pieces? Would love your input as to which one to buy. William sonoma offers one that produces small ravioli. Thank you …great newsletter! I’ve made ravioli with the tray. 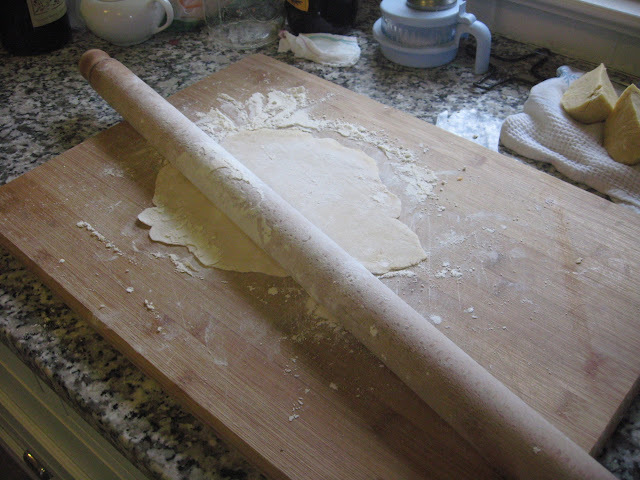 But recently at a friend’s house, we used the well worn, extra large ravioli rolling pin. 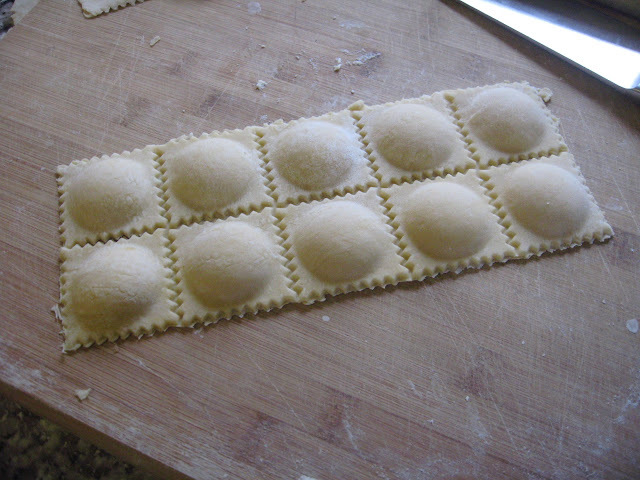 A 30″ square of so many perfect ravioli is a beautiful sight to behold! I made your Alfredo Sauce recipe last night and put it on homemade egg noodles and it was a huge, huge hit! Your sauce is what I’ve been looking for all of my life! Thank you so much for posting such a great recipe…and it’s sooooo easy, too!!!!. I am now back on your site looking up more recipes!